Throughout the Middle East region last week, overall instances of battles increased to coincide with a drop in events involving only explosions/remote violence, such as airstrikes, IEDs, and shelling. Reported fatalities continued to rise, following an upward trend since the beginning of March 2019. Demonstration events, meanwhile, decreased even further throughout the region with the exception of Palestine and Bahrain. 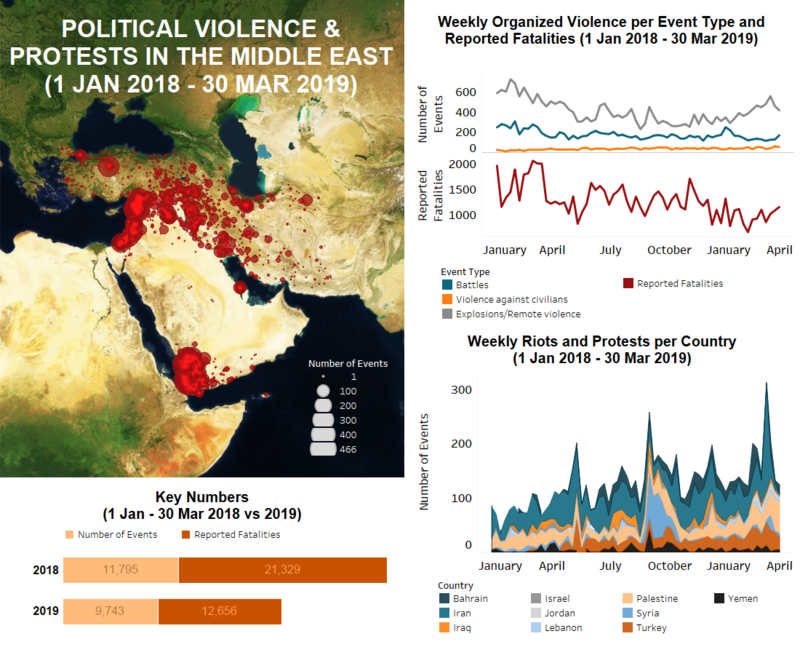 Massive flooding and Nowruz festivities are the likely culprit for the decrease in demonstrations in Iran, with only one event being reported last week. Last week in Israel, at least 60 rockets were launched from the Gaza Strip on Tuesday night, prompting three days of intense exchange between Israeli forces and Gazan resistance groups – particularly Hamas and Palestinian Islamic Jihad (PIJ). Seven Israelis were reportedly injured when a rocket hit their home north of Tel Aviv. Bomb shelters were opened throughout southern Israel and in Tel Aviv, while additional Israeli forces were deployed to the border area, and Iron Dome batteries were deployed nationwide. Dozens of residents from towns near Gaza demonstrated in Sderot against the continuous fighting and the hazardous security situation. Local frustration against the state’s response to Palestinian rocket fire indicates that this recent spike in violence is likely to impact the upcoming Israeli election on 9 April. Meanwhile, a number of incendiary devices also reached Israel from Gaza and injured one farmer (for more on those, see this ACLED analysis piece). Elsewhere, an Israeli prison guard was seriously injured when a Palestinian prisoner at the Ketziot prison stabbed him in the neck. The incident, and subsequent crackdown on prisoners, resulted in riots and the injury of 120 prisoners. Prisoners announced that they will begin a hunger strike in retaliation beginning 7 April, just two days before the election (Times of Israel, 1 April 2019). In Palestine, Hamas and PIJ positions in the Gaza Strip were targeted extensively by Israeli airstrikes after a rocket launched from Rafah injured seven Israelis. Several Hamas headquarters were destroyed, including the office of Ismail Haniyeh in Gaza City. In total, 30 buildings were destroyed, and 500 neighboring structures were damaged, which displaced dozens of families. Seven Palestinians were reported to have been injured during the strikes, however no fatalities were reported. A ceasefire deal brokered by Egypt reportedly went into effect on 31 March (AP, 31 March 2019). Meanwhile, the Palestinian Night Confusion unit continued its activities across Gaza last week and a number of incendiary balloons and crude explosives were launched across the border. An Israeli drone strike targeted a group of Palestinians responsible for launching incendiary balloons in northern Gaza, reportedly injuring three. Elsewhere along the border, the Great March of Return demonstrations were held on Saturday instead of Friday as a means to coincide with the one-year anniversary of the marches on Land Day. Approximately 40,000 Palestinians gathered for the demonstrations. Israeli forces opened fire on rioters, reportedly killing four Palestinians – two of whom were minors. A further 316 Palestinians were reported injured during the demonstrations, 64 by live fire. Among the injured were journalists and health workers (for more on Israeli violence during demonstrations, see this recent ACLED infographic). In the West Bank, tensions remained high between settlers and Palestinians as at least three price tag attacks were reported, stones and Molotov cocktails were thrown at cars, and an Israeli child was shot in the hand by fire allegedly coming from Jalazun village. Demonstrations were held across the West Bank in solidarity with Palestinian prisoners in Israel and as part of the commemoration of Land Day. An 18-year-old health worker was reportedly killed in clashes with Israeli forces in Dheisheh refugee camp, Bethlehem. This event once again raised concerns of whether Israeli forces are intentionally targeting medical workers (Al Jazeera, 27 March 2019). In Lebanon, a secret service officer was allegedly shot dead by an unidentified gunman on Tuesday in Wadi Khalid, Akkar governorate. Protests, meanwhile, were held against pollution in Halba and Deir al Ahmar. A total of 437 Syrian refugees returned to Syria through the Yabous and Talakalakh crossings of Lebanon, while more than 1,300 returned from Jordan through the Nassib crossing with Syria. In Jordan proper, demonstrations were focused on the Jordanian-Israeli peace treaty and gas deal. On Friday, around 3,000 Jordanians took to the streets of downtown Amman to oppose the treaty, while another sit-in was held in front of the House of Representatives against the gas agreement. Also in the capital, a group of unemployed Jordanians from Mafraq province ended their ten-day-long sit-in after an agreement was signed with the government promising them better working opportunities. Another labour demonstration was held in Al Ramtha by the drivers who operate the route to Syria against heightened inspection procedures at the Jaber border crossing. In Iran, only one demonstration was reported last week as the country continues to deal with a national flooding crisis coinciding with Nowruz (Persian New Year) celebrations. Forty-three people have reportedly died so far and tens of thousands have been displaced, mostly in the north and west. Angry Iranians have taken to social media to criticize the Rouhani administration’s poor response to the floods (Atlantic Council, 29 March 2019). It is likely that this anger will translate to the streets in upcoming weeks. In Bahrain, meanwhile, more than a dozen riots and protests took place over the week. Several demonstrations took aim at the Formula One Grand Prix motor race, an event which has been used as an occasion to protest the regime’s human rights record since 2011. (Human Rights Watch, 22 March 2019). Other rallies were held in remembrance of Issa Ahmad Qambar, a Shiite man who was executed in March 1996 on charges of killing a police officer (NY Times, 27 March 1996). In Turkey, violence targeting political opposition parties and their property increased in the final days before nationwide local elections on 31 March. The majority of targets were members of the Kurdish-majority Peoples’ Democratic Party (HDP), although Democrat Party (DP) campaigners were also attacked by a mob on at least one occasion. On 30 March, police arrested over 60 HDP politicians in home raids across the country, the reason for which is still unknown (Kurdistan 24, 30 March 2019). Elsewhere, ethnic Kurds were assaulted and arrested by police during Nowruz celebrations. The week before last, a number of Kurdish prisoners had committed suicide as part of a mass agitation against the treatment of political prisoners, including Kurdistan Workers’ Party (PKK) leader Abdullah Öcalan (ANF, 26 March 2019). Last week, their funerals were held in several towns across the southeast. Peoples’ Democratic Party (HDP) personnel were blocked by police from attending – a move supported by Turkish Interior Minister Suleyman Soylu who called the deceased a “terrorist” and claimed that the HDP were attempting to organize a PKK solidarity meeting at the burial site (Democracy Chronicles, 28 March 2019). Police similarly intervened in an HDP demonstration outside the Institute of Forensic Medicine in Istanbul (for more on HDP opposition and political party violence, see this recent ACLED infographic). Meanwhile, the PKK’s youth wing Patriotic Revolutionary Youth Movement (YDG-H) claimed several acts of property destruction in Istanbul and Bursa last weekend as part of the prisoner agitation. Elsewhere in the southeast, a number of clashes occurred between security forces and PKK militants in the provinces of Agri, Diyarbakir, and Hakkari. In the latter, Turkish soldiers reported intercepting an explosives-laden drone sent from across the Iraqi border. The PKK is known to operate partially within northern Iraq. Similar to previous weeks, Turkish warplanes targeted alleged PKK positions throughout the governorates of Dahuk and Erbil. Further south in Mosul, demonstrators gathered once again to demand an inquiry into the deadly sinking of a ferry on the Tigris the week before. Meanwhile, Islamic State militants continued their insurgency against Iraqi state forces across the country, albeit with fewer reported attacks than previous weeks. Flash floods are expected to spillover from Iran into eastern Iraq this week, likely hitting the governorates of Diyala, Wasit, and Maysan hardest (Kurdistan 24, 29 March 2019). It remains to be seen how this will affect the political landscape in the region. In Yemen, fighting between Houthi forces and forces backed by the internationally-recognized government continued to escalate last week, with intense clashes reported throughout many parts of the country. Government troops claimed small territorial gains in Kitaf district of Sadah governorate, Abs district of Hajjah governorate, Damt district of Ad Dali governorate, and Misrakh district of Taiz governorate. Throughout the week, Saudi-led coalition airstrikes bombarded Houthi targets in several areas, a number of which hit civilians. Among these was a strike on a hospital supported by the ‘Save the Children’ organization in Kitaf district that reportedly killed at least 7 civilians, including children and aid workers. Meanwhile, dozens of ceasefire violations were reported in Hodeidah governorate last week including shelling, clashes, machine gun fire, and barricade-building. Areas directly surrounding the embattled port city were the location of heavy fighting, including clashes that were described as being the most intense since the beginning of the ceasefire agreement, which was implemented on 18 December of last year. Finally, fighting between Al Qaeda in the Arabian Peninsula (AQAP) and IS forces escalated in Wald Rabi district of Al-Bayda, with reported territorial gains made by AQAP militants. In Syria, regime shelling continued in the countrysides of Aleppo, Idleb, Lattakia, and Hama governorates in and along the DMZ. Rebel and Islamist groups such as Hayat Tahrir al Sham (HTS) responded by shelling regime positions in Hama. Contrary to the previous week in which there was an increase in Russian airstrikes across Idleb, none were reported last week. Elsewhere, Israeli warplanes targeted what appeared to be a pro-Iranian militia command center in the industrial area of Sheikh Najjar, located on the outskirts of Aleppo city. The airstrikes resulted in massive damage to the area, and reportedly killed seven Iranian and pro-Iranian fighters (Radio Farda, 28 March 2019). This is not the first time Israel has hit Iranian targets in Syria, and tensions have risen recently between the two nations as a result of Iranian support for Gazan liberation groups – particularly the militant PIJ (Haaretz, 29 March 2019). In the east, clashes between the remnants of IS and Syrian Democratic Forces (QSD) continued on a smaller scale despite the overtaking of the remaining IS-controlled territories in the Baghuz region, Deir-ez-Zor governorate, the week before. Fighting took place mostly within the nearby mountainous area, which IS militants have managed to infiltrate and fortify. In coordination with QSD ground assaults, Global Coalition airstrikes targeted IS tunnels in the same area.